When you purchase a car the buyer has the right to transit the city, and in the time frames should be exchanged for regular registration plates. The law provides that when buying a car, you must register it within 5 days. In the case of obtaining transit plates, put the car on the account within 20 days. Since 2010, the fine for late registration increased from 300 to 800 R.
Passport, the title to the vehicle, the contract of sale or bill of sale. 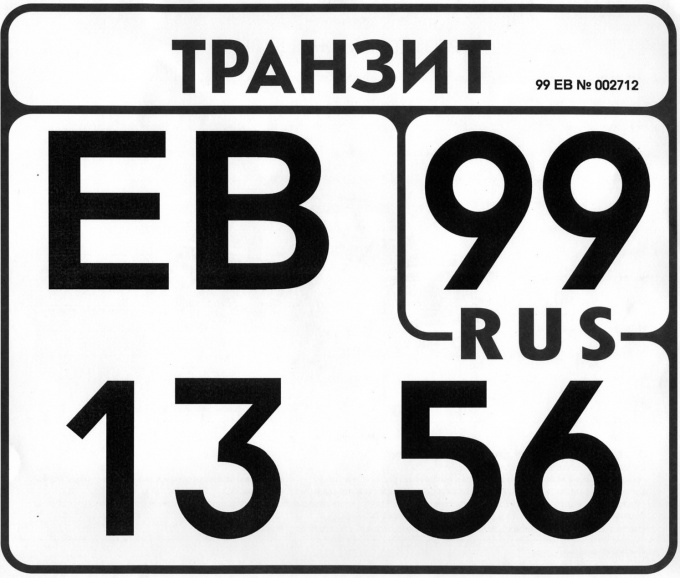 According to the order № 1001 of the Ministry of internal Affairs of the Russian Federation in cases when an unregistered vehicle is outside the territory covered by the activities of registration division in his registration, the owner or the vehicle owner is obliged within 5 days to in the registration Department at the location of vehicle registration marks "transit" for ferrying the vehicle to the place of registration. When issuing the registration signs "transit" in the document certifying the right of ownership of the vehicle, and the vehicle registration document is marked "transit" indicating the series, number, date of issue and validity of signs, which shall be signed by the official having issued these signs, and printing. The basic document for obtaining transit plates in the traffic police is to help account, which can be obtained at the place of purchase of the machine. The traffic police authorities give transit plates using a metal, a plastic or paper base. The cost of obtaining metal or plastic offer is 1000R, paper – $ 100. Experience shows that independently obtaining transit plates, the traffic police can take all day. The owner has the right to apply to any of any Department of traffic police. When you purchase a car in the showroom, the car market or in a thrift store that has appropriate registration, temporary license plates can be issued directly at the place of purchase. This may be done separately. When you purchase a car from a private entity, be sure to execute the contract of sale with notarized. When receiving transit numbers he will be the main document certifying the legality of purchasing a car. If the period of validity of transit numbers are close to expiration, and the car got to the site of the proposed permanent registration, it is necessary to exchange transit license plates to the new one. Exchange procedure similar to the procedure for obtaining them. Getting a transit hotel in the store, in the cabin or on the market, you should pay attention to their validity. The car with transit numbers frequently checked by the traffic police. When planning a long trip, it is recommended to get a metal or plastic transit license plates.